According to relevant Chinese regulations, training and examination/certification must be provided by separate entities. Using the criteria for selection of training institutions developed by the Board, and upon evaluation of several training institutions, the Board selected Beijing University’s Boya Strategy Management and Consulting as the training institution. Boya conducted trainings in accordance with the terms set by the FCCE Secretariat and approved by the Board and the series of courses included in the FIDIC Guide to Practice and Contracts Training manuals. FIDIC’s Internationally Accredited Trainers (IATs), are Dr. Peter Boswell (Environmental Management, Quality Management), Mr. Ike van der Putte (Project Sustainability Management, Project Procurement), Mr. Hak Bong Hyun (Management of Claims and Dispute Resolution, Mr. John Ritchie (Professional Services Agreements, Business Development), Mr. Stephen Jenkins (Enterprise Risk Management), and Mr. Zoltan Zahony (Advanced Contracts). A team of 15 FIDIC Accredited Trainers was also established, including numbers of technical experts and economic scholars from Chinese engineering consulting firms and universities, to support the IATs in their training activities. They were selected in 2011 and accredited by FIDIC after being trained by the IATs. 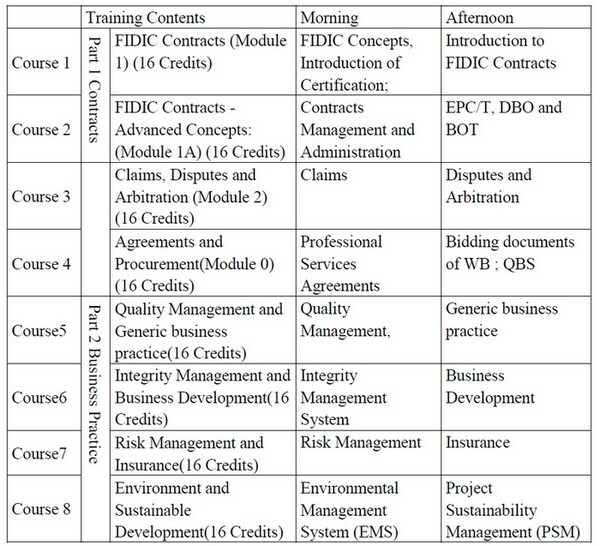 FCCE training covers 4 modules of Contracts, and 4 modules of Business Practices. Relevant training materials were compiled and translated into Chinese. As of April 2018, Boya organized 9 training courses, with a total of 1,444 candidates trained as shown below.